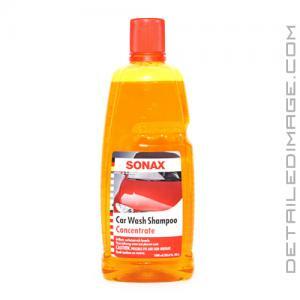 A great detail starts off with a great wash and the SONAX Car Wash Shampoo Concentrate is the perfect auto shampoo choice. This is a pH neutral and phosphate free formula that will not strip off any sealant or wax, so it's a great maintenance shampoo. Fill the cap up with the Shampoo and empty it in to 3 - 5 gallons of water and you'll have a bucket filled with suds. The anionic surfactants cling to dirt and other contaminants so they can be safely removed from the surface. The formula has great lubricity so the contaminants glide off with ease. The large 33.8 ounce bottle makes this a great value on this top quality shampoo. It even has a pleasant scent that makes the washing process more pleasurable. The Car Wash Shampoo Concentrate is a shampoo you are sure to love so pick up a bottle today. SONAX Gloss Shampoo Concentrate is a highly effective, phosphate-free and pH-neutral formula that penetrates and loosens tough dirt without damaging or stripping the protective layer. The special anionic surfactants within, simultaneously adhere and distribute dirt particles and act as emulsifiers absorbing and dissolving oil droplets. SONAX Gloss Shampoo Concentrate is safe for all finishes and leaves a brilliant, clean shine to your paint, rubber, plastic, vinyl and glass surfaces every time! DIRECTIONS FOR USE: Rinse vehicle first to remove excess dirt and wet the surface. Measure two (2) capfuls of SONAX Gloss Shampoo Concentrate into a 5 gallon bucket and fill with warm water. Wash the vehicle from top to bottom with a soft sponge. Rinse with clean water and wipe immediately with a soft cloth or chamois. Rinse hands after use. PLEASE NOTE: Protect against frost or freezing. For best results, use SONAX Gloss Shampoo Concentrate when vehicle is cool and away from sunlight. Rinse off shampoo residue immediately, do not allow to dry on. Got this as a free gift for a large order placed. I would say it definitely did the trick for keeping the wax on. I P21S 100% Carnauba and that will last 3-5 months. I usually wash the car once a week so for me it does as advertised. Going to order some more right now haha! I usually don't like gloss enhancing shampoos due to the fact that they leave spots and don't always rinse freely. But this shampoo really impressed me. Nice amount of suds and really did enhance the gloss of the paint.